Maybe you’re not quite old enough to remember the early 80’s risqué’ blue jean advertisements of Brooke Shields telling the world that nothing comes between her and her Calvins. Even today, designers of denim tout about how they have the perfect jean to fit any figure…long or short legs, small or large hips, and all body shapes and sizes. 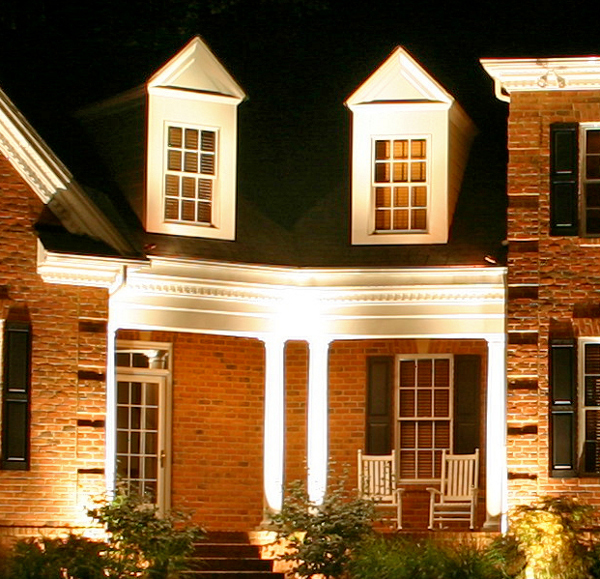 The same can be said for what type of outdoor lighting is the best “fit” for you home. One size does not fit all. When you speak the language of outdoor lighting you take into consideration your homes length, width and depth. For example on an artist’s palette you may have hues of red, blues and greens. The amount of each color the painter will use on his canvas will depend on what he is painting. For instance, if he is painting a landscape, chances are the artist would use predominately greens. Would the artist be able to use those same greens to achieve a rendering of an autumn sunset? Of course not, that is why this analogy shows that the same lighting design and application does not work on homes with different dimensions or architectural styles. Each home is different and individual and should be treated as such when it comes to designing the outdoor lighting. Outdoor Lighting Perspectives of Nashville designs an outdoor lighting application that accentuates your homes individual “curves”, just like a good pair of jeans on your body should. A small ranch style home would have a much different outdoor lighting design than a larger custom-built home would. A typical ranch style home is a good package to focus on the width of the home, because in most cases a ranch reflects a longer design. With this style of home you want to use outdoor lighting to add depth, so it’s not a one-dimensional flat canvas. A good lighting design would incorporate smaller trees closer to the home and the outward landscaping of the home to accentuate the homes curves as well. Creating depth is not always about the features of the home but also using a homes unique landscaping to create depth. 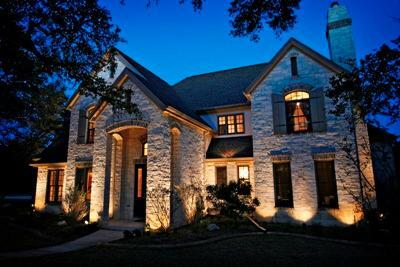 Proper outdoor lighting on larger, custom-built homes begins with focusing on the width of the home as well. In most cases this type of home will not be flat across the front. With custom homes you want to stretch the width with the use of light to accentuate any peaks, eaves or arches and maximize their uniqueness and beauty. Illuminating across the front of the homes exterior and accentuating the homes height is key to maximizing the home’s beauty as well. We like to pick out vegetation to the left and right of the home so it flanks the home and frames the entire picture. This type of design also lets people know that when they drive past your home it looks even larger with properly placed and applied outdoor lighting. Outdoor Lighting Perspectives of Nashville also uses architectural features such as stonework, retaining walls or any specialty element to create shadow and depth. One crucial thing that most often gets overlooked in outdoor lighting illuminating the dormers on a home, this is important in allowing your outdoor lighting application to achieve height and balance. When it comes to lighting backyard scenarios we generally consult with the homeowner to find out where they spend most of their time in the backyard. We will sit on the patio or at a table on the covered porch of a prospective client and take different aspects of the landscape and vegetation into consideration in order to frame and light these areas with a room type atmosphere, so your eye never really stops. We can even illuminate certain trees to accentuate their colors, like a Japanese maple, or create a canopy by lighting tall trees. 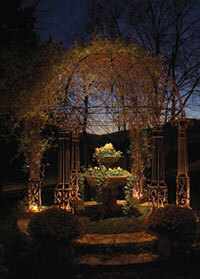 The effects that can be created by lighting a backyard landscape can be breathtaking. We always strive to get that “perfect fit” for you with all aspects of lighting your property. This entry was posted in Architectural Breaks, Architectural outdoor lighting, Landscape Lighting, Lighting Design Concepts, Outdoor Lighting, Outdoor lighting design, Outdoor Lighting Installation, Outdoor Lights Nashville, Residential outdoor lighting and tagged architectural lighting, Garden lighting, Landscape Lighting, lighting design, lighting specialist, moonlighting, Outdoor Lighting, Outdoor Lighting Application Nashville TN, Outdoor Lighting application TN, Outdoor Lighting Design Nashville TN, Outdoor Lighting Design TN, outdoor lighting Nashville, outdoor lighting perspectives by Michael Wynn. Bookmark the permalink.